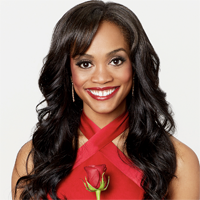 The Bachelorette Rachel Lindsay is a "little pissed off" after seeing Becca Kufrin's "happy ending"
In an Us Weekly article, Lindsay explained that she is thrilled that Becca received a happy ending. But watching last night's finale showed her "that I was denied my on-camera happy ending." She adds: "Do I sound a little pissed off? Well that is because I am. Take a trip down memory lane to exactly, oh let’s say one year ago. Becca did not sit on stage for three hours and watch the finale for the first time in front of a live audience. Becca did not have to deal with someone telling her she would live a mediocre life. Becca did not have to deal with being baited with real time questions about her emotions watching certain scenes. Nope, that was me. Let’s just be honest, Becca did not have the finale that I had. There was no controversy and she was not put in a position to face any. She was protected and I was placed on display for three hours and labeled an angry black female. And there will always be that stigma attached to my finale because it has been said that when truth is blurred by misinformation, perception becomes reality and all is lost."